Does Failure to Control Speed and Keep a Proper Distance from other Vehicles Prove a Gross Deviation from the Standard of Care that an Ordinary Driver Would Exercise Under the Circumstances? 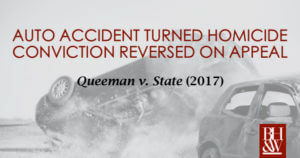 The Court of Criminal Appeals recently handed down an opinion in Queeman v State regarding criminally negligent homicide. The issue facing the court was whether a death, which was caused by Appellant’s failure to control the speed of his vehicle and failure to maintain a proper distance from another vehicle, proves a gross deviation from the standard of care amounting to criminally negligent homicide. Trial Court Found Appellant Guilty of Criminally Negligent Homicide. Appellant was traveling down a two-lane highway when he drove into the back of an SUV that was waiting to make a left turn onto an intersecting road. The impact caused the SUV to be pushed into oncoming traffic where it was subsequently hit, killing one of the passengers. The accident investigator could not determine Appellant’s actual speed, and there was no other evidence to suggest a reason for his inattentiveness. However, Appellant was charged and convicted of criminally negligent homicide and sentenced to eighteen months in a state jail facility. The Court of Appeals Reversed the Conviction, Holding that the Evidence was Legally Insufficient to Support the Conviction. On appeal, Appellant challenged the sufficiency of the evidence from which his conviction was based upon. The accident investigator admitted that he had no way of knowing Appellants actual speed, nor did he know the amount of time or reason the Appellant was inattentive. The court of appeals determined that the evidence at hand provided no reasonable basis for the jury to prove that Appellant was traveling at excessively high speeds or was distracted for a certain reason—such as texting. As such, an inference would only amount to mere speculation. Therefore, the Court of Appeals reversed the trial courts decision. The defendant’s failure to perceive such risk constituted a gross deviation from the standard of care and ordinary person would have exercised under similar circumstances. However, the Court notes that the amount of carelessness for criminally negligent homicide is much higher than for civil negligence. Here, the Court agreed that Appellant’s conduct was negligent, however it held that the conduct did not rise to gross negligence. While the evidence was sufficient to prove that the defendant was speeding, it was not sufficient to prove that he was excessively speeding, and the State presented no evidence concerning the reason or length of time for which Appellant was inattentive. Absent any other evidence to show a failure to perceive a substantial and unjustifiable risk caused by the defendant’s conduct, no reasonable jury could have found that Appellant’s conduct constituted a gross deviation from the standard of care of an ordinary person under the circumstances. Therefore, the Court of Criminal Appeals affirmed Appellant’s acquittal.